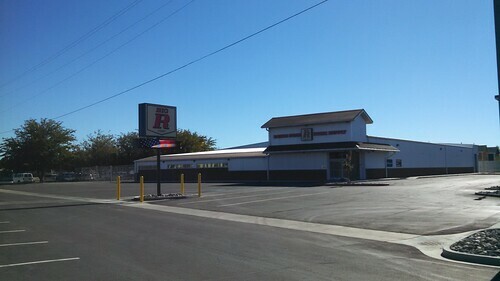 I have written many times here about the long-delayed appearance of a Big R Ranch & Home store here in Fernley. While driving to Fallon for supplies has been something of a change of pace for us, we'd be happier to (for instance) not have to drag the utility trailer so far afield to buy firewood. It's astonishing that it's taken the better part of two years to get this store open. The owners of Big R West must really think they've got a winner here in Fernley; less-committed people would have thrown up their hands in frustration and walked away from the project. A few days ago, the store's parking lot sign, complete with lighted changeable sign-board, appeared. For now it's running this flag graphic and a test pattern, but we have hope that this means that they will maybe have the paper off the windows and the doors open for business before we have to buy another pallet of firewood. It will be very nice to have a hardware store within walking distance again.